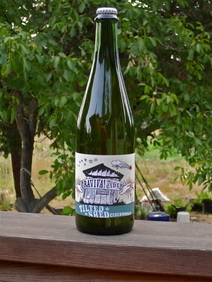 Sebastopol, CA (March 19, 2013) – Apple Sauced Cider™, a Sebastopol-grown cidery, is seeking local residents to donate apples from their backyard for a community cider blend called “Backyard” cider. Apple Sauced Cider will donate 100% of the profits from this batch of cider to Slow Food Russian River and its Apple Core project, which is responsible for raising awareness of and preserving the county’s apple heritage through marketing the region. As members of Slow Food Russian River and apple growers themselves, Hunter and Jolie Wade of Sebastopol’s Apple Sauced Cider aim to engage community members and give back by producing a “backyard” cider, a true expression of Sebastopol’s unique flavors. The cidery is looking for Sebastopol residents’ backyard apples to be donated and blended into a community cider. In the middle of August, the cidery invites all those who can donate to drop off early-season apple varieties, including gravensteins and others, into large bins at Devoto Gardens and Orchards in Sebastopol (Date TBA). The apples will be washed, pressed, fermented, and bottled by Apple Sauced Cider™ . The cidery will then donate 100% of the profits from this batch. Great Cider Starts With Great Fruit. And you can’t really like cider without being fairly keen on apples. Expect more about apples – orchards, pollinators, varietals, history, tastings, fruit expression. *A nice turn of phrase from the always interesting American Orchard.